Model 1404 Stereotaxic Instrument is a general purpose, heavy-duty research instrument. Its superior rigidity, large frame bars and precision bearing surfaces assure absolute alignment of laboratory animals for indefinite periods of time. Model 1404 consists of a Kopf Model 1430 Frame Assembly and four Model 1460 three-dimensional electrode manipulators. Model 1770 Electrode Holder with corner clamp is included. Manipulator resolution includes 100 microns (0.1 mm) all axis. Model 1430 Stereotaxic Frame modified with Model 1725 Universal Clamp and Stand Post mounted to Model 1711 Intracellular Base Plate. 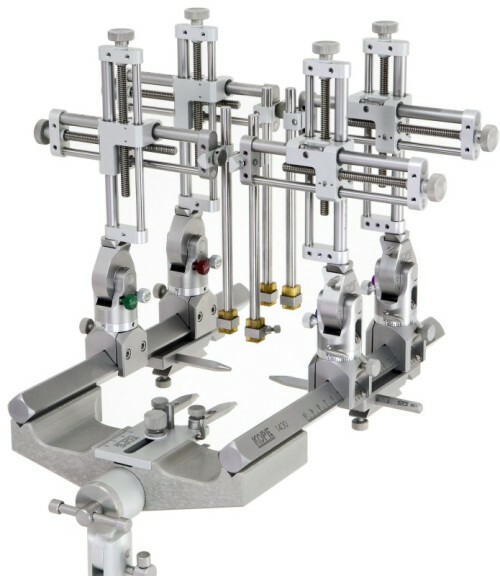 This versatile option enables the frame height to be easily adjusted up or down, as well as moving the entire stereotaxic instrument to a new location. (Model 1730 Intracellular Frame utilizes this set-up). Model 1770 Standard Electrode Holder with corner clamp. Vernier scales on manipulators assure unmatched accuracy and repeatability. Ideal when there is a critical need for rigidity.